Note: Please visit the Completed Area Plans & Other Specific Plans page to view the final information regarding the High Occupancy Housing Specific Plan. The basis for the work on High Occupancy Housing comes from the Student Housing Action Plan External Work Group. 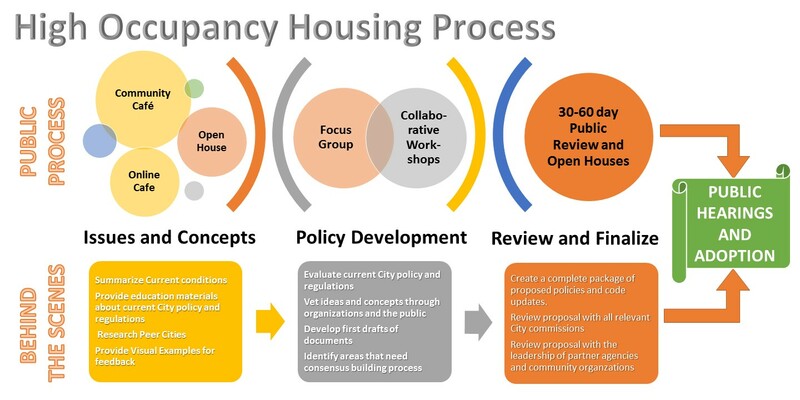 "Develop a specific plan for high occupancy housing that implements Policy NH.1.7. Develop appropriate programs and tools to ensure the appropriate placement, design, and operation of new student housing developments consistent with neighborhood character and scale." Their recommendations can be found here. What is High Occupancy Housing? High Occupancy Housing (HOH) is generally buildings that house more than 75 persons per acre or have more than 30 units per acre in dormitory or apartment-style units. Due to a combination of pent up demand, constrained supply and the 2011 changes to the Zoning Code to promote mixed use development, interest in large multi-family housing projects has grown. The Village at Aspen Place (601 E Piccadilly Dr) is the first example of high occupancy housing built in the City. The City has launched an interactive map to guide the public through exploring peer cities that were investigated as part of the research that went in to the preparation for the open houses. Have you subscribed to the Flagstaff Community Forum yet? Surveys will be posted on the Flagstaff Community Forum throughout the process. Monday, July 18th, 5pm to 7pm at Our Lady of Guadalupe Church, 224 South Kendrick St.
Monday, August 1st, 5:30pm to 7:30pm at the Flagstaff Main Library, 300 W Aspen Ave. Using this method, the project team got feedback from almost 80 participants, who developed over 800 comments. You can review the comments and feedback received in the Community Cafe Summary Document. The Online Cafe on the Flagstaff Community Forum, gave another opportunity for the public to engage with the questions asked at the in-person Community Cafés. You can browse all the comments provided here. Only comments for registered site users appear public. The project team can see your comments and enter them into the public record offline. It was open from August 5 to September 7, 2016. NAU was not in session during the Cafe over summer meetings so student participation was low. On November 2, over 30 NAU students participated in discussions with the same questions from the previous Community Cafe meetings. This meeting was necessary to connect the diverse perspectives on this topic. The Open Houses were the second step in the public outreach process. The purpose of the meetings was to share the findings harvested from the cafes, to share information about how other communities are tackling similar issues, and to discuss the breadth and form of the policy work. Presentations from the project team can be viewed online through the City's streaming service here. You can review the Policy Workshop meeting notes here. The project team held a drop-in time at the Flagstaff East and Main libraries on August 2nd and 3rd. The project team was available throughout the 60 day review to help everyone be able to participate in the process of setting these important policies. We still would welcome the opportunity to join you at your meeting, grab a cup of coffee or tea, or visit you in your neighborhood. After a year of public involvement, the City of Flagstaff produced a draft of the High Occupancy Housing Specific Plan. You can download the document here or you can review a copy in-person at the Community Development County in City Hall or at either of Flagstaff's public library. There was almost weekly opportunities to learn more about the proposal and provide feedback to the City during the 60-day comment period. Comments were due to the City by September 27, 2017 at 5pm by mail or e-mail. There was multiple focused presentations at Commission meetings throughout the 60 day comment period. You can also view or review any of these presentations on the City's live streaming system: www.flagstaff.az.gov/streaming or by clicking the "Watch the video" link below. You can find closed topics related to this project posted on the Flagstaff Community Forum and review the comments we received first hand. This tool allows you to filter and sort and download the public-facing responses. If you have questions or concerns, please call Sara Dechter, Comprehensive Planning Manager at (928)213-2631 or email her at sdechter@flagstaffaz.gov.